Stretching the One Income Dollar: (March 7th) is #NationalCerealDay ! (March 7th) is #NationalCerealDay ! In case you didn’t know, tomorrow (March 7th) is National Cereal Day! To celebrate, Kellogg Canada is serving up some delicious insights from the first-ever #NationalCerealDay survey. And the results are absolutely scrumptious! Are you a Lovey-Dovey Life Lover? Or maybe a Nutty Know-It-All? How about a Dynamic Daredevil? 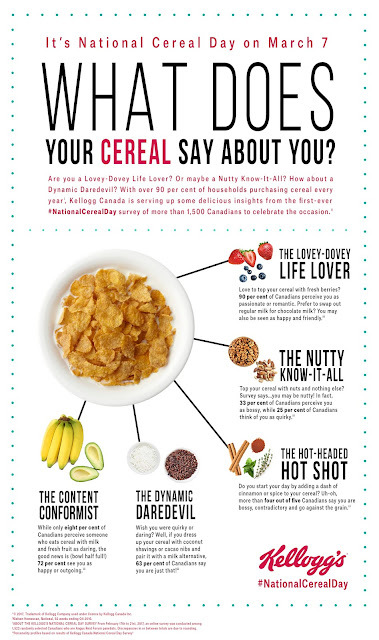 To help cereal-lovers across Canada discover what their cereal says about them, we've got this interesting info-graphic to share with you. Gerry is the Lovey Dovey Life Lover. I don't qualify for cereal topping. Being lactose intolerant , I don't drink lactose free milk, so don't eat breakfast cereal with milk. When I eat it- mine is just as is- no milk and no topping!